As you may have read, a couple of months ago my husband and I traveled to England without our sons. And while it was a kid-free getaway, it also involved househunting, school touring and attempting to learn to drive on the other side of the road. Because we're moving to England! My husband works for a large, Fortune 500 company. And while working for "the man" (as I like to tease him) has its drawbacks, one of the perks was that we might have an opportunity to move internationally for a period of time. We've desired that kind of experience for our family for years. With facilities all over the world, we didn't know where or when something would come our way. 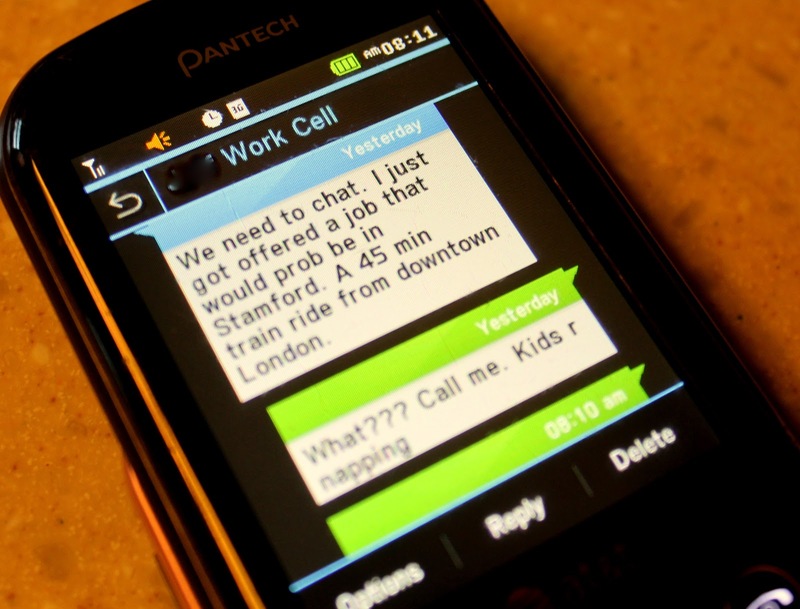 And then I got the text that changed our lives back in November when he was there on a routine business trip. And now here we find ourselves, planning to set off "across the pond" for the next three years. We plan to locate ourselves somewhere around Stamford, a small community about an hour north of London by train in the Lincolnshire area. It's quite charming and famous for being the home of Burghley House (which itself is famous, at least in the U.S., for being where several scenes from the movie Pride and Prejudice were filmed). We may adjust this depending on housing availability when we arrive, but that's our target location. My husband will actually work in Peterborough, a larger city just about 10 minutes away. Many U.S.-based companies have offices in Peterborough, so I've been told there is an active expat organization in the area. -When do you leave and how long will you be gone? We hope to move in early June, although the immigration process is unpredictable and there are other hiccups that I'm sure we'll deal with along the way. Of course! Our travels and adventures are bound to get more exciting and interesting. I hope you'll stick around and keep reading. I'm planning to do some site redesign in the next couple of months, and I'm sure I'll get busy with all the tasks that moving requires. So things may be a bit sporadic around here until we're settled. But Arrows Sent Forth is definitely not going away! On a professional note, I am longer blogging for Visit Indiana (since my Hoosier travels are temporarily coming to an end). I have also wrapped up some other freelance writing commitments I've established here in the last couple of years. But fortunately, I've been able to develop a relationship with Anglotopia.net, the largest website devoted to British culture (which, interestingly enough, is headquartered in northwest Indiana). I'm looking forward to sharing not only travel stories and video there, but also our experience adjusting to the British way of life and becoming a family of expats. -Will you be on House Hunters International? I can't tell you how many people have told us to call the show. The pressure of finding a new home over there is plenty, I don't need cameras following me around! But seriously, my husband and I had the chance to look at several places while we were there. Those exact homes will likely not be available by the time we arrive, but at least we got a sense of our options and price range. Some were adorably charming in a uniquely European way. Others were modern and spacious and very much in keeping with the style of homes you might find here in the States. We would definitely lean toward something with historical character and closer to town so that we might walk as much as possible. But who knows where we'll end up. -And finally, how are you feeling? A really thoughtful friend asked me this immediately upon hearing the news. To be honest, until she posed the question, I'm not sure I had stopped to take a breath and really think about that. We are very excited that the international experience we'd always hoped would come our way is in Western Europe, a part of the world we already love and can't wait to share with our sons. Quite honestly, we're thankful there will be no language barrier beyond debates over whether its a cookie or a biscuit or color vs. colour. I suppose this means it is less exotic... but I've got a 3- and 1-year-old who are fluent in the language of Tantrum, so I'll take easy when given the choice. We will live 10 minutes from a train station that will get us to King's Cross Station in London in less than an hour. Which will then get us on a train to just about anywhere in Europe. I've already priced flights to various cities and am finding it is far more affordable than flying in the U.S. And we'll be right along a major motorway that runs from the south of England straight up into Scotland. The variety of travel experiences at our fingertips will be pretty amazing. Letting our kids get acclimated to a new way of life is exciting and (in my opinion) so beneficial. To know what a big world it is and to have their passport stamped at such an early age is incredible. We feel extremely fortunate to be in this position. We're beyond sad at the thought of leaving family and friends and significantly impacting the grandkid/grandparent/aunt/uncle/cousin relationships. (And losing their help, which was always available at a moment's notice!) I've never lived more than an hour away from my immediate family. So this will take some getting used to for me. I frankly have trouble even thinking about it. I'm also nervous for Big Arrow. He's a sensitive kid and I'm sure this big change will affect him (mostly positively, no doubt, but the transition will likely be bumpy at times). Children in England start school full-time, all-day at age 4, so we've got him enrolled and he'll begin this fall. That in itself will be a major adjustment for a kid who still regularly naps and is used to spending hours upon hours with his mom. The boy who constantly asks me if he can wear sweatpants to preschool will soon be donning a blazer, trousers, button-down shirt and a tie each morning. None of this would stop us from embracing this adventure. But I think it's important to acknowledge that making a move like this is not just endless walks down cobblestone streets and as much fish and chips as our hearts desire. It will involve sad goodbyes, major disruptions of our day-to-day routine, and establishing ourselves in a new community. But it's all part of this experience, for which we are incredibly grateful. We feel ready to take this step. So pull on your wellies, pour a cup of tea, and follow us on this new journey. Cheers! What incredible news - I am so excited for you! Friends of ours were transferred to London for his work a few years ago. They spent 3 years (if I recall correctly) and we were able to visit them while they were there. They are now back in Canada and living in Vancouver. They have twin girls who had just turned 6 when they left and I believe the schooling was one of the hardest adjustments for them. If you have any questions and would like me to connect the two of you then I'm sure that she would be happy to chat. Congratulations on the big move!! Oh my goodness! What an exciting time you have ahead of you. I can't wait to hear all about the adjustments and your adventures to follow! Just followed your posts from Facebook to get all the details. I think this is wonderful news. There's so much I love about England and I can't wait to hear about what living there as an expat is like. You'll have to connect with Heather on Her Travels, who lives in Bristol (a WONDERFUL place to visit with kids and surely an easy train ride from where you'll be living). We actually stayed at her house when we visited England last. I'm such a believer in having faith, closing one's eyes, and stepping into the unknown. Kudos to you for having the courage to make this huge (and I'm sure positive) change. How exciting! I'm sure I would feel the same way, but I look forward to following the Arrows to England. That is AWESOME! Since my girls are 8 months and 2 1/2, it's easy for me to try to imagine how exciting, nerve-wracking, draining, and exhilarating it could be to move "across the pond" with little ones! I'll try to make sure Indiana is well represented in the blogosphere! :) Enjoy your adventure! I lived in London for 2 years. It flew by so quickly and I miss it terribly. However, be prepared that 3 years might turn into longer or a transfer somewhere else--which is what happened to us (totally was ok with me!). Also, I'm sure your husband's firm is providing this but make sure you have private insurance as not to rely on the NHS. That's so exciting. We are a 1.5 years into what was supposed to be a 2 year expat assignment in Malaysia, but we have just extended for a 3rd year. Being outside London sounds so ideal because you probably already know so much about English life. I agree that being away from extended family has been the hardest part of living on the other side of the world. Skype is very helpful but is sometimes a poor substitute for being there in person. Good luck on your preparation and move! Knowing you and your family will make this so very exciting for me. And having lived in Europe myself for a few years, I know you will love the experience. I hope to follow all of your adventures very closely! This blog made me smile and I especially liked your comment "if they develop British accents, so help me God, I may never be able to discipline them. The cuteness would just melt me." Cheers!! I have only just started following your blog and found it through Visit Indiana posts -- but as little as I know about you, I am so very excited for you and your family! Best of luck to you as you make this transition and I will look forward to reading of your experiences! how exciting!! I hope you all enjoy your time there. This is just such a thrill! I cannot wait to follow your adventures, atlhough I wish I was going along with you! What an exciting new chapter for you! I lived in London for 2.5 years and travelling from there is so easy and cheap. Europe is at your door step. Have a great time! I am thrilled for you! Sounds so exciting! Can't wait to read all about it. Ooh Stamford, how lovely. Peterborough not so much. Really only useful for being a stop on the East Coast mainline railway... Beautiful Cambridge (where I work) is an easy 45 min drive away. Hope you don't find our houses too small. We may have a slight tendancy to think that all Americans live in houses the size of football fields ( too much extreme makeover: home edition??). Oh, and the NHS? It is brilliant. Best of luck - it' ll be epic. This is certainly exciting! Happy for you, enjoy! First, I have to say how much I love www.arrowssentforth.com. This lastest blog in which you share so many emotions and experiences in a crisp, fascinating way just shows me all the more what a gifted and skilled writer you are! Secondly, I have to say how relieved I am that you will continue writing so that we can follow the little arrows and your family. The photos combined with the writing will comfort me when I am missing the little arrows on Sundays. Finally, these comments really show the power of blogging. It looks like you are getting lots of support and great ideas for this huge change. Congrats! From one of those Americans who lives 50% in Peterborough, I know you'll have a trip/home of a lifetime! Nicole-how exciting for your an your family! I wish we'd had the chance to do such a thing when we were early in our careers, so I can see how this seems like good timing for you. I'm also glad to see we'll be able to continue to read about your travel adventures here on your blog, and I love that you've already lined up a relationship with another outlet where you can share your writing and photos as well. well this is exciting! London has few of the best clubs in the world and the night life is super awesome. There are so many things you can do there and I'm pretty sure you would really enjoy your stay there!